A post! A post, you guys! I think I may have forgotten how to actually write one of these, been so long. Turns out that moving and starting a new job and all that fun stuff + a mega snow storm and all the shenanigans that happened as a result have left me a little busy and away from the computer. I’m still settling into the apartment, so no photos of the space yet. I’m loving it though. There are a few negatives–paper (PAPER) thin walls–ok, maybe only one negative, but generally I’m liking living downtown. And even with the noise, it’s a little comforting, like I’m not alone, you know? 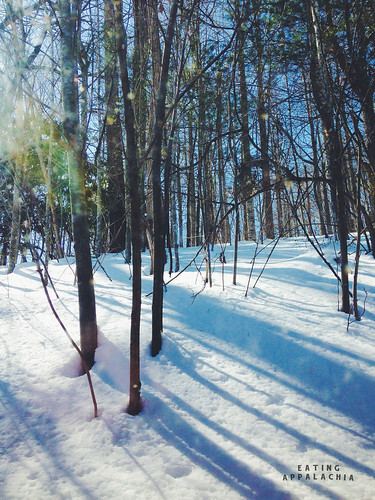 The epic snowdays we had this past week were super fun, especially. I think downtown Roanoke accumulated 22″ or something! (There are still neighborhoods that aren’t plowed out yet…eeek.) After drinking a beer or two, I decided that I absolutely needed to take my singlebeast (single speed mountain bike) out to play–an excellent decision. 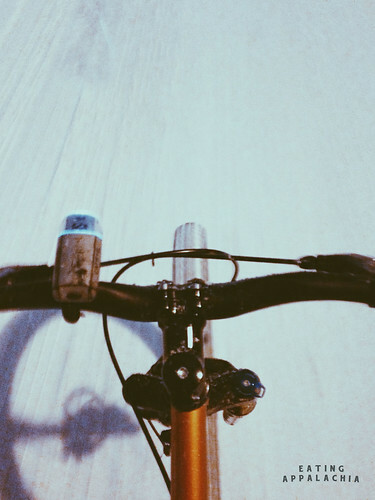 I’m not going to say I’m very good at biking in the snow, but it was SO MUCH FUN. Thankfully very few cars were out and the snow was mostly rideable. By the time it’d reached about a foot, though, I was at the pushing state. Worth it. On Friday, the day after the snow, I, unfortunately, had to drive in to Blacksburg for the first full day at my new job and, holy crap, when 22″ falls in this area DO NOT try to drive on the expressways until after 24-48 hours have passed. It was the most stressful drive I’ve ever made. I’m talking 1″ of ice and snow covering much of the expressway plus up to a foot of snow on the ramps. *Shudder* But I made it and I think I’m going to dig this new job a lot. Plus, look at that view out of my office! I’ve heard foxes and groundhogs sometimes walk around right outside the window. Cannot wait. Friday was also Valentines Day and I celebrated it Galentines style with a girlfriend at Lucky. Here’s a crappy cell phone photo to prove it. 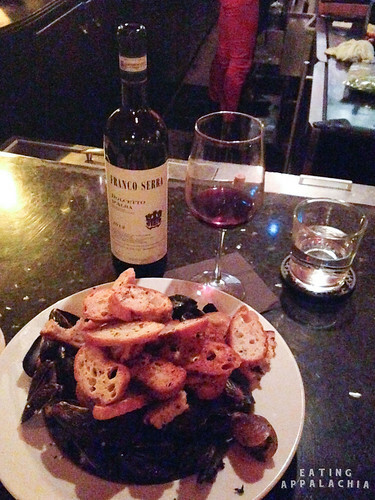 Bottles of wine, a little whisky, a delicious bread plate, and mussels–this girl can’t ask for anything more. I’m blessed to have such good friends (and to be within walking distance of Lucky now)! But a recipe–I actually have a recipe for you today. Incredible, right? Given the snow and general cold and malaise of winter, soup is a standard right now. The other week I picked up a package of frozen rice cakes at the asian grocery store and knew that I wanted to reinterpret the Korean Chicken and Dumplings I tried at Kalbee in Pembroke. I hadn’t been blown away by Kalbee’s dish, but I loved the concept (also rice cakes are good pretty much at any time in any way). 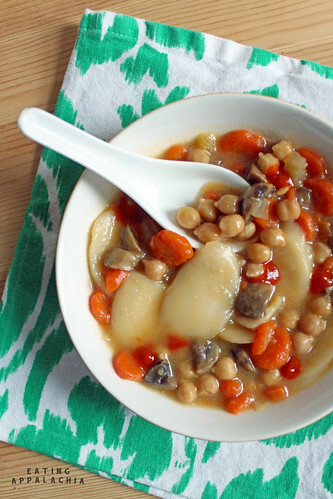 For the broth base, I added some miso, then went pretty standard with chickpeas, carrots, celery, onions, and mushrooms, then finished with the rice cakes. Garnished with a bit of goguchang or Sriracha for a spicy kick, it’s a seriously good and seriously simple take on chickpea noodle soup. And I’m glad it turned out well because, a week later, I’m still eating it. I really need to learn to cook for just one person, been too long. Any favorite tips for making smaller batches or keeping it interesting in a one-person house? In a stock pot, warm the oil over medium heat. Add the onion, carrots, and celery and cook until the carrots and celery begin to soften. Add the mushrooms and cook 5-6 minutes, just until they begin to release their juices. Add the garlic and cook another minute, until fragrant. Taste and add salt to taste. Once the chickpeas are soft, add the rice cakes and cook another 10-15 minutes, until the rice cakes are soft. You may need to add more vegetable broth at this point because the rice cakes will soak up a decent amount of liquid. Serve with goguchang or Sriracha to spice things up a little. What is yr new job?? Can I ask? The view really is gorgeous. The rice cakes look slightly gelatinous to me…but anything topped with gochujang is usually fantastic. So. Dang Jes that soups looks incredible, I have never had those frozen rice cakes but they look like something I would love! I’ll have to keep an eye out. I can’t imagine dealing with all that snow, it’s been so long since I’ve been around it. Stay safe, OK? Ooh, yay! Soup for all! I have a container of gochujang hanging out in the cupboard unused, so I’m excited to have some idea what to do with it besides making a bucketload of kimchi. Cooking for just yourself is a challenge. We used to live in a 7-person house in grad school–coming down off that was tough. Two things: 1. buy less, so you can only make so much of a given thing with the right proportions and 2. make things you can freeze in 1-portion containers. Or 3. start having dinner parties! 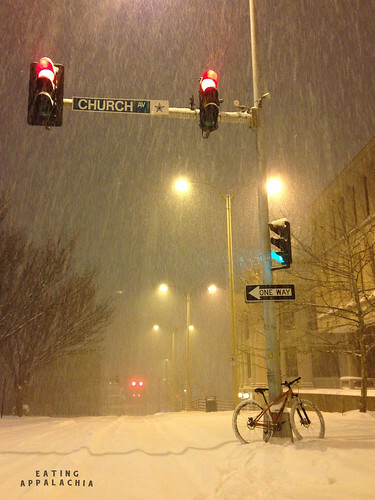 Love your Church Avenue in the snow picture! Clearly I need to head to the Asian market to look for frozen rice cakes immediately! Wow! I’ve never seen frozen rice cakes but they look really cool. Yum!